The U.S. National Transportation Safety Board (NTSB) determined that Asiana flight 214 crashed when the airplane descended below the visual glidepath due to the flight crew’s mismanagement of the approach and inadequate monitoring of airspeed. The Board also found that the complexities of the autothrottle and autopilot flight director systems, and the crew’s misunderstanding of those systems, contributed to the accident. On July 6, 2013, the Boeing 777 was on approach to runway 28L at San Francisco International Airport, California when it struck the seawall at the end of the runway. Three of the 291 passengers died; 40 passengers, eight of the 12 flight attendants, and one of the four flight crewmembers received serious injuries. The other 248 passengers, four flight attendants, and three flight crewmembers received minor injuries or were not injured. The impact forces and a postcrash fire destroyed the airplane. 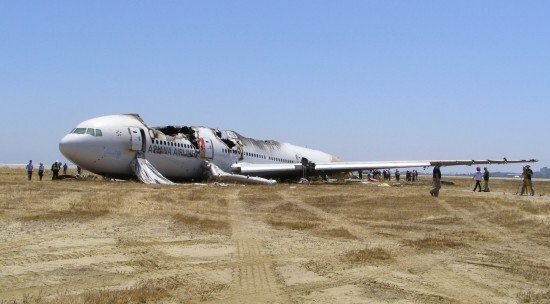 As a result of this accident investigation, the NTSB made recommendations to the Federal Aviation Administration, Asiana Airlines, The Boeing Company, the Aircraft Rescue and Firefighting Working Group, and the City of San Francisco. These recommendations address the safety issues identified in the investigation, including the need for reinforced adherence to Asiana flight crew standard operating procedures, more opportunities for manual flying for Asiana pilots, a context-dependent low energy alerting system, and both certification design review and enhanced training on the Boeing 777 autoflight system. The recommendations also address the need for improved emergency communications, and staffing requirements and training for aircraft rescue and firefighting personnel.